I was planning to review some more eye shadows today but then I stopped and said, hey, it is your birthday tomorrow, why not dreaming a little so I prepared a list which I would love to get my hands on. Some of them will probably end up in my Christmas Wish List as well, especially the perfumes and the watch since I have been eyeing these for quiet a while. I have been loving my Tissot watch for the last ten years and never thought I would need another one so soon but it turns out mine started having some minor problems now and then so I got my eyes on this beauty a few months ago. I usually like using watches with white backgrounds but once combined with diamonds instead of numbers, this one with black background and silver bracelet won my heart. A lovely floral chypre from one of my favorite noses, François Demachy. I have been circulating around Dior Counter (like the moon around earth!) in the department store and always end up spraying this from head to toe as my nose each time follows me to where it is. I have Oud Ispahan for winter, which is, along with my never ending love for Eau Noire, my favorites from La Collection Privée line. I am not usually big on roses but the rose inside Gris Montaigne isn't too pronounced on me, it lasts long and it is very day appropriate. I am having a long affair with Coromandel and I have been through various samples of it. I also enjoy Beige from the same line which is a easy day time beauty but Coromandel is more than that, it is edgy and unique, a rich woody oriental tune to my nose but it is unlike anything, like a mystery which should never be solved. The only thing which kept me away from investing in a full bottle was the fact that it is EDT but I have seen that my large bottle of Beige is holding strong since two years. I may pull the trigger any minute. I tried to order that one from US but it was sold out just a few hours ago before I could hit the button. Then it was an in-store exclusive, so hard to get for me with an international CC. Now that I know it will be reaching our shores soon, I can't wait to try it out! There are three of these beauties, each one more beautiful than the other. It will be very hard to select one, or two, or maybe three? Since the promo images hit online, this one has been on my radar. That split-pan palette is too gorgeous to use and I am very curious about the trios too. I am even thinking to try out one of their lipsticks from this collection, never tried a Suqqu lippy before, any recommendations? Was it a long list? I am not even done yet. 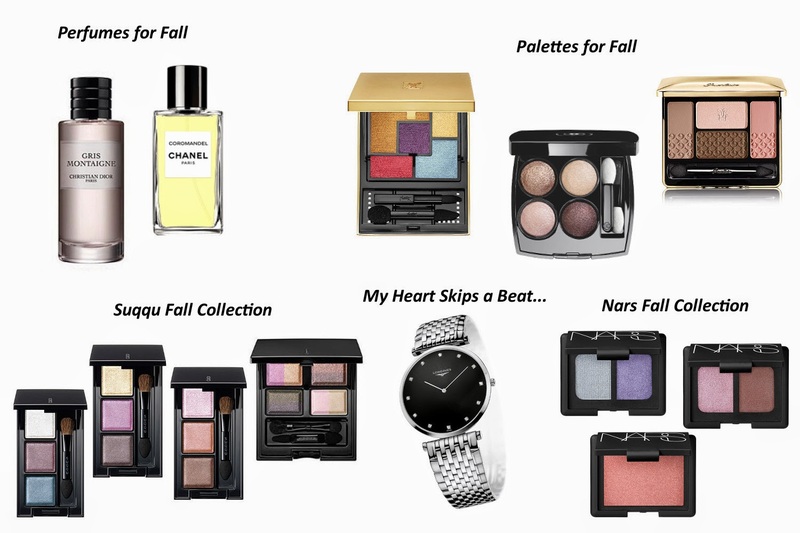 Tom Ford Fall Collection is going to be a big haul for me because I have been eyeing almost everything from that one. I have been also enjoying permanent MAC Eye Shadows at the moment and may end up getting a second empty palette to fill out during the months to come. I also have a long Hakuhodo order list for the months to come. What is in your wish list at the moment? Anything common to mine? Great wishlist! to congratulate in advance brings bad luck, and we don't want that do we? heck no! Holiday Collections are really great! I can't wait for them either. Especially the highlighter from Chanel. I don't have any information about TF Holiday, do you? Which Airport has Les Exclusives, I must fly there! happy birthday sara!! i hope you get everything on your birthday wishlist and more!! and, yes i love everything on your list that's why i just adore you so much!! xoxoxo to you!! many hugs and thanks so much for your birthday wishes. We have very similar taste! Happy birthday Sara!! I hope you get everything on that wish list. Happy birthday Sara! I hope you have a lovely day. Enjoy it!! Happy Birthday!! :) I really loved the look of the Guerlain Palette that you put on the photo, looks really gorgeous! Wow for your choices, they are very similar to mine: it could be for the same zodiac, Leon??? Few days ago was my birthday too and two gifts were Mademoiselle (the last of the new Chanel's quads: now I own all of them!!!) and Malice (Joues Contraste). Oh Mademoiselle and Malice, I love both of them, I hope you enjoy them as much as I do.